Indian law prohibits owning a firearm without a proper license. Similarly, the US law forbids the purchase of guns by convicted felons. On May 6, 2013, a video surfaced on the internet showing a young man in blue jeans and a black polo shirt firing a single bullet from an off-white, plastic 380 single-shot pistol called “the Liberator”, fabricated by him with a Stratasys 3D printer bought on eBay. That young man was Cody Wilson – a Texan law student, who overnight turned into a cult figure and garnered headlines worldwide. After test firing, Wilson published the blueprints of the gun’s design online, which was downloaded in excess of 120,000 times in two days. Following this, the US Department of State clobbered a restraint order against Wilson and his company ‘Defense Distributed’ which was overturned in August this year, allowing him to once again freely publish designs of 3D printed guns and share the same with one and all on the internet. These blueprints would potentially allow anyone with a 3D printer to make an untraceable, unregulated gun at home. The 3D blueprints are today also available on several CAD (computer-aided design) repository sites and can also be downloaded for free from torrent sites. Thirty seconds of googling are all one would need to fish out these files. It’s kind of creepy to envisage that in our country today, we have no clue as to how many of our citizens possess a 3D printer, how many of them have downloaded the blueprints of 3D guns and how many of them are in possession of 3D printed guns? Could 3D printing threaten national security? Not a day goes by without a story on a new advance or application in 3-D printing technology. While the technology promises cost and manufacturing benefits for many consumer, industrial, and medical parts, there’s concerns the technology might also get into the hands of adversaries building weapons to use against countries. That’s the conclusion of a new RAND Corporation paper that suggests the access to additive manufacturing could enable military adversaries, violent extremists and even street criminals to easily produce their own weapons for use and sale. Moreover, the study noted that 3-D printing technology is susceptible to hacking, which could enable hackers to maliciously instruct 3-D printers to introduce flawed instructions or algorithms into mission-critical parts of airplanes. Author Supercharg3dPosted on 8th May 2018 28th June 2018 Categories Wider ImplicationsTags SecurityLeave a comment on Could 3D printing threaten national security? The RAND Corporation has published a paper discussing the threat of 3D-printed weapons and other items, which it argues could put global, national and personal security at risk. 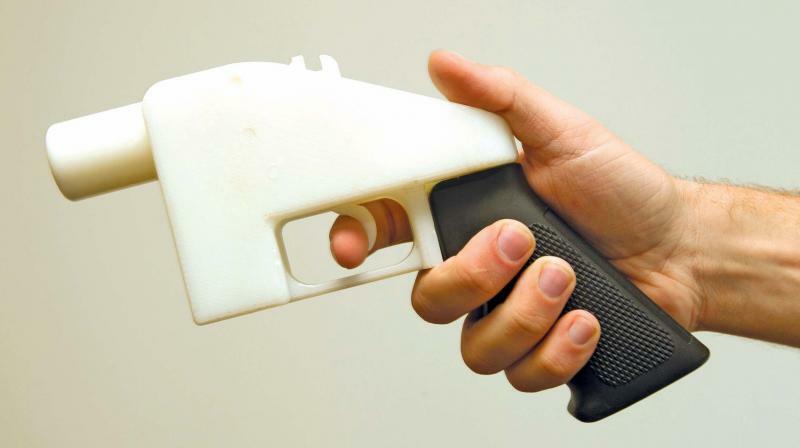 The issue of 3D-printed weapons came to prominence in 2012, when Defense Distributed – a US-based group – announced that it would design a working gun which could be manufactured by anybody owning a 3D printer. After Defense Distributed posted its first blueprint for the gun online, the US Department of State demanded that it must be removed, although guns can still be printed using patterns lingering on file sharing websites. Since then, the threat of such easily accessible and difficult to regulate firearms has been discussed in the US and elsewhere. Now, a RAND Corporation paper, Additive Manufacturing in 2040: Powerful Enabler, Disruptive Threat, has laid out in detail the potential dangers of 3D printing, including its exploitation by military foes, extremists and street gangs. The growth of 3D printing could “significantly accelerate weapon proliferation and have dramatic effects on international conflict, violent extremism and even everyday crime,” the report said. In this age of the digital twin, Rize, Inc. is using its innovative 3D printing ink feature to reconnect physical objects with its digital record. By now, we all know the advantages of 3D printing parts. From prototypes to end-use parts, you can make anything you need, anytime you need it… so long as it fits in the build area. There are no geometrical restrictions, no limits to complexity—the extruder will manifest anything your CAD skills allow you to design, from spherical latticed doodads to spiraling, Escher-inspired blocks. Plus it also lets you get by with a virtual inventory, as a reserve can be created on-demand. The process isn’t quite as easy hitting the old Windows command, CTRL + P to spit out part, at least not yet. The problem is, like when a conventional 2D printer converts the digital to physical, growing a brand new 3D-printed part has an unavoidable consequence.